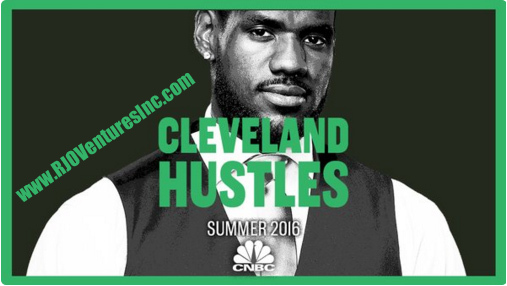 LeBron James - CNBC - Cleveland Hustles - Featured @ RJO Ventures Inc - Jan 2016. For Promotional Use Only. CNBC Greenlights ‘Cleveland Hustles’ with NBA Superstar LeBron James and ‘The Partner’ with Marcus Lemonis. CNBC announced the network is teaming up with NBA superstar LeBron James' and Maverick Carter's production company, SpringHill Entertainment, and Magical Elves for a new unscripted series set in Cleveland, Ohio. The series, set to debut in Summer 2016, will give local entrepreneurs the chance to realize their own dreams while also helping to revitalize struggling neighborhoods in their city.